President of Ukraine Petro Poroshenko, Prime Minister of Ukraine Volodymyr Groysman and Secretary of the National Security and Defense Council of Ukraine (NSDC) Oleksandr Turchynov have congratulated Ukrainians on the Constitution Day of Ukraine. "The history of domestic constitutionalism dates back more than three centuries, when in 1710 the world saw one of the most progressive documents of its time - "Pacts and Constitution of the rights and liberties of the Zaporizhian Army" by Pylyp Orlyk. 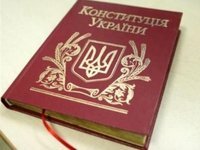 And today the Ukrainian Constitution, as the heir of ideas and principles, laid down in the document of the famous hetman, is one of the most democratic Basic Laws in the world. Let us respect the ideas and principles according to which Ukraine lives and let's protect them together! I congratulate you on the Constitution Day!" Poroshenko wrote on Facebook on Thursday morning. Groysman in his greeting noted the importance of the constitutional rights of Ukrainians and respect for the Basic Law. "The Constitution demands respect from us. It marks the absolute value of a person, his life, honor and dignity, since there is nothing more valuable. Although in time the basic law of the country may require improvements. But it is very important that these improvements serve the interests of Ukrainians," he wrote on his Facebook page. Turchynov also congratulated his fellow citizens on the Day of Constitution of Ukraine and noted: "The Constitution is the fundamental law of the state, its cornerstone, on which it is possible to build such a Ukraine, worthy of our nation, which is free, independent, fair and European state of equal opportunities and free people!" Turchynov's congratulatory message reads posted on the website of the National Security and Defense Council on Thursday morning.